Grease a large skillet with spray shortening or oil. Place the tortillas over a flat surface to the side. Portion out 1/4 cup chocolate chips and 1/4 cup marshmallows and place over a tortilla. Fold each tortilla in half to cover the filling. Heat the pan over medium heat and add a filled tortilla. Cook for one minute or until the tortilla begins to brown. Don’t forget to turn over and toast the other side. Repeat the process with the remaining tortillas. When finished, cut each quesadilla into several pieces for easy finger food. If you like, you can add peanut butter and banana slices to the quesadillas. 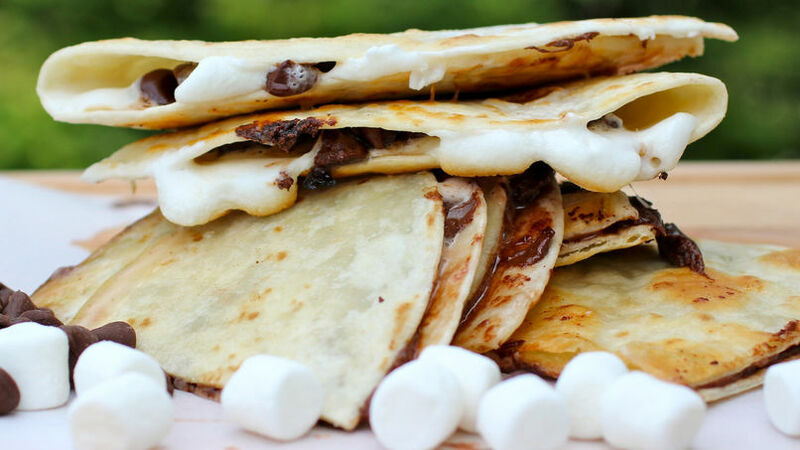 Quesadilla s’mores are a delicious dessert that showcases the versatility of the quesadilla. If you can’t resist the temptation of a new dessert, this is a perfect recipe for finishing your meal with a sweet toquecito. This Latino version of the classic campfire s’mores is the perfect dish for sharing with amigos on a special occasion. The best part of this quesadilla recipe is that it doesn’t require many ingredients either. I promise you that the kids will love it- when I make this dessert, my own children can’t get enough!